Habsburg Spain was a superpower and the center of the first global empire in the 16th century. It had a cultural golden age in the 17th century. With the Peace of Utrecht (1713), Spain, stripped of its territories in Italy and the Low Countries, lost most of its power, and became a second rate nation in Continental politics. However, Spain maintained its vast overseas empire until, beginning with declarations of independence in Venezuela and Paraguay (1811), successive revolutions split away its territories on the mainland of the Americas. Nevertheless, Spain held onto significant fragments of its empire in Asia, America and Oceania until the Spanish-American War of 1898, and in Africa until 1975. Three examples set for the Spanish empire are to be recognized in the Aragonese, Burgundian and Portuguese Empire. The Castilian kings, meanwhile, tolerated the Moorish taifa client-kingdom of Granada by exacting tributes of gold, the parias, and, in so doing, ensured that gold from the Niger region of Africa entered Europe. Castile also intervened in Northern Africa itself , competing with the Portuguese Empire, when Henry III of Castile began the colonization of the Canary Islands in 1402, sending Norman explorer Jean de Béthencourt. The marriage of the Reyes Católicos (Ferdinand II of Aragon and Isabella I of Castile) created a confederation of reigns, each with their own administrations, but ruled by a common monarch. According to Henry Kamen, Spain was created by the Empire, rather than the Empire being created by Spain. The Castilian Empire was the result of a period of rapid colonial expansion into the New World, as well as the Philippines and colonies in Africa: Melilla was captured by Castile in 1497 and Oran in 1509. The Catholic monarchs decided to support the Aragonese house of Naples against Charles VIII of France. As ruler of Aragon, Ferdinand had been involved in the struggle against France and Venice for control of Italy; these conflicts became the center of Ferdinand's foreign policy as king. In these battles, Gonzalo Fernández de Córdoba would found the Spanish infantry of the 16th and 17th centuries. In 1492, Spain drove out the last Moorish king of Granada. After their victory, they negotiated with Cristopher Columbus, a Genoese sailor attempting to reach Cipangu by sailing west. Columbus instead inadvertently discovered America, inaugurating the Spanish colonization of the continent. As sole monarch, Ferdinand adopted a more aggressive policy than he had as Isabella's husband, enlarging Spain's sphere of influence in Italy and against France. Ferdinand's first investment of Spanish forces came in the War of the League of Cambrai against Venice, where the Spanish soldiers distinguished themselves on the field alongside their French allies at the Battle of Agnadello (1509). Only a year later, Ferdinand became part of the Holy League against France, seeing a chance at taking both Milanto which he held a dynastic claimand Navarre. The war was less of a success than that against Venice, and in 1516, France agreed to a truce that left Milan in her control and recognized Spanish control of Upper Navarre. Upon the settlement of Hispaniola which was successful in the early 1500s, the colonists began searching elsewhere to begin new settlements. Those from the less prosperous Hispaniola were eager to search for new success in a new settlement. From there Juan Ponce de León conquered Puerto Rico and Diego Velázquez took Cuba. The first settlement on the mainland was Darién in Panama, settled by Vasco Núñez de Balboa in 1512. This Castilian Empire abroad became the source of Spanish wealth and power in Europe, but contributed also to inflation. Instead of fueling the Spanish economy, American silver made Spain dependent on foreign sources of raw materials and manufactured goods. The economic and social revolutions taking place in France and England were nonexistent in Spain. Genoese and German bankers, as the Fuggers. Genoese (Andrea Doria), Portuguese (Magallanes, Quirós, Torres) and Venetian sailors. German and Italian soldiers, e.g. Ambrosio Spinola. Maintaining Catholic Habsburg hegemony in Germany, defending Catholicism against the Reformation. 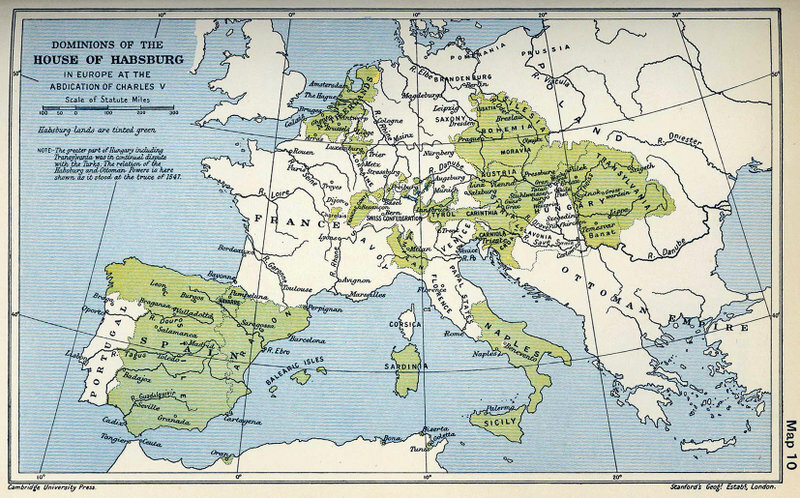 As a result of the marriage politics of the Reyes Católicos, their grandson Charles inherited the Castilian empire in America, the Aragonese Empire in the Mediterranean (including a large portion of modern Italy), as well as the crown of the Holy Roman Empire and of the Low Countries and Franche-Comté. This Empire was constituted by inherited territories, not conquered. After defeating Castilian rebels in the Castilian War of the Communities, Charles was the most powerful man in Europe, his rule stretching over an empire not to be rivaled in size until Napoleon. Charles attempted to quell the Protestant Reformation at the Diet of Worms but Luther refused to recant his "heresy." However, Charles's piety could not stop his mutinied troops from plundering the Holy See in the Sacco di Roma. After Columbus, the colonization of the New World was led by a series of warrior-explorers called the Conquistadors. Native tribes were usually at war with one another and some of them were only too willing to form alliances with the Spanish in order to defeat powerful enemies, such as the Aztecs or Incas. This task was greatly facilitated by the spread of diseases (e.g. smallpox) common in Europe but unknown in the New World, which decimated the native American population. The most successful conquistador was Hernán Cortés, who in 1520-1521, with thousands of Amerindian allies, overran the mighty Aztec empire, thus making Mexico a part of the Spanish empire; this would be the basis of the colony of New Spain. Of comparable importance was the conquest of the Inca empire by Francisco Pizarro, which would become the Viceroyalty of Peru. After the conquest of Mexico, rumours of golden cities (Cibola in North America, El Dorado in South America) caused several more expeditions to be sent out, but many of those returned without having found their goal, or having found it, finding it much less valuable than was hoped. In 1521, Francis I of France, who found himself surrounded by Habsburg territories, invaded the Spanish possessions in Italy and inaugurated a second round of Franco-Spanish conflict. The war was a disaster for France, which suffered defeat at Biccoca (1522), Pavia (1525, at which Francis was captured), and Landriano (1529) before Francis relented and abandoned Milan to Spain once more. Charles's victory at the Battle of Pavia, 1525, surprised many Italians and Germans and elicited concerns that Charles would endeavor to gain ever greater power. Pope Clement VII switched sides and now joined forces with France and prominent Italian states against the Habsburg Emperor, in the War of the League of Cognac. In 1527, Charles grew exhausted with the pope's meddling in what he viewed as purely secular affairs, and sacked Rome itself, embarrassing the papacy sufficiently enough that Clement, and succeeding popes, were considerably more circumspect in their dealings with secular authorities: in 1533, Clement's refusal to annul Henry VIII of England's marriage was a direct consequence of his unwillingness to offend the emperor and have his capital perhaps sacked a second time. The Peace of Barcelona, signed between Charles and the Pope in 1529, established a more cordial relationship between the two leaders that effectively named Spain as the protector of the Catholic cause and recognized of Charles as king of Lombardy in return for Spanish intervention in overthrowing the rebellious Florentine Republic. In 1528, the great admiral Andrea Doria allied with the Emperor to oust the French and restore Genoa's independence, a renewed prospect opened: 1528 marks the first loan from Genoese banks to Charles (Braudel 1984). Spain was relatively early in passing some laws for the protection of the natives of its American colonies, with the first such laws being passed in 1542; however, records suggest that the practice never matched the theory. In 1543, Francis I, king of France, announced his unprecedented alliance with the Ottoman sultan, Suleiman the Magnificent, by occupying the Spanish-controlled city of Nice in concert with Turkish forces. Henry VIII of England, who bore a greater grudge against France than he held against the Emperor for standing in the way of his divorce, joined Charles in his invasion of France. Although the Spanish army was soundly defeated at the Battle of Ceresole, in Savoy, Henry fared better, and France was forced to accept terms. The Austrians, led by Charles's younger brother Ferdinand, continued to fight the Ottomans in the east. Charles went to take care of an older problem: the Schmalkaldic League. The League had allied itself to the French, and efforts in Germany to undermine the League had been rebuffed. Francis's defeat in 1544 led to the annulment of the alliance with the Protestants, and Charles took advantage of the opportunity. He first tried the path of negotiation at the Council of Trent in 1545, but the Protestant leadership, feeling betrayed by the stance taken by the Catholics at the council, went to war, led by the Saxon elector Maurice. In response, Charles invaded Germany at the head of a mixed Dutch-Spanish army, hoping to restore the Imperial authority. The emperor personally inflicted a decisive defeat on the Protestants at the historic Battle of M�hlberg in 1547. In 1555, Charles signed the Peace of Augsburg with the Protestant states and restored stability in Germany on his principle of cuius regio, eius religio, a position unpopular with Spanish and Italian clergymen. Charles's involvement in Germany would establish a role for Spain as protector of the Catholic, Habsburg cause in the Holy Roman Empire; the precedent would lead, seven decades later, to involvement in the war that would decisively end Spain as Europe's leading power. Charles had preferred to suppress the Ottomans through a considerably more maritime strategy, hampering Ottoman landings on the Venetian territories in the Eastern Mediterranean. Only in response to raids on the eastern coast of Spain did Charles personally lead attacks against the African mainland (1545). The one and only Charles V's legitimate son, Philip II of Spain (r. 1556-1598) parted the Austrian possessions with his brother Ferdinand. Philip treated Castille as the foundation of his empire, but the population of Castile (which was much less than that of France or England) was never great enough to provide the soldiers needed to support the Empire. When he married Mary Tudor, England was allied to Spain. Spain was not yet at peace, as the aggressive Henry II of France came to the throne in 1547 and immediately renewed conflict with Spain. Charles' successor, Philip II, aggressively prosecuted the war against France, crushing a French army at the Battle of St. Quentin in Picardy in 1558 and defeating Henry again at the Battle of Gravelines. The Peace of Chateau-Cambrésis, signed in 1559, permanently recognized Spanish claims in Italy. In the celebrations that followed the treaty, Henry was killed by a stray splinter from a lance. France was stricken for the next thirty years by chronic civil war and unrest (see French Wars of Religion) and removed from effectively competing with Spain and the Habsburg family in European power games. Freed from effective French opposition, Spain saw the apogee of its might and territorial reach in the period 1559-1643 . Florida was colonized in the 1560s. On April 27, 1565, the first permanent Spanish settlement in the Philippines was founded by Miguel López de Legaspi and the service of Manila Galleon was inaugurated. Manila was established in 1572. After Spain's victory over France and the beginning of France's religious wars, Philip's ambitions grew. In 1565, the Spanish defeated an Ottoman landing on the strategic island of Malta, defended by the Knights of St. John. Suleiman the Magnificent's death the following year and his succession by less capable Selim the Sot emboldened Philip, and he resolved to carry the war to the sultan himself. In 1571, Spanish and Venetian warships, joined by volunteers across Europe, led by Charles' illegitimate son Don John of Austria annihilated the Ottoman fleet at the Battle of Lepanto, in one of the most decisive battles in naval history. The battle ended the Ottoman naval threat in the Western Mediterranean and initiated a long period of decline for the Ottoman Empire. This mission marked the height of the respectability of Spain and its sovereign abroad as Philip bore the burden of leading the Counter-Reformation. The time for rejoicing in Madrid was short-lived. In 1566, Calvinist-led riots in the Netherlands prompted the Duke of Alva to march into the country and restore order. In 1568, William the Silent led a failed attempt to drive the tyrannical Alva from the Netherlands. These battles are generally considered to signal the start of the Eighty Years' War that ended with the independence of the United Provinces. The Spanish, who derived a great deal of wealth from the Netherlands and particularly from the vital port of Antwerp, were committed to restoring order and maintaining their hold on the provinces. In 1572, a band of rebel Dutch privateers known as the watergeuzen ("Sea Beggars") seized a number of Dutch coastal towns, proclaimed their support for William and denounced the Spanish leadership. For Spain, the war was a slow-moving disaster. In 1574, the Spanish army under Luis de Requeséns was repulsed from the Siege of Leiden after the Dutch broke the dykes, thus causing extensive flooding. In 1576, faced with the bills from his 80,000-man army of occupation in the Netherlands and the massive fleet that had won at Lepanto, Philip was forced to accept bankruptcy. The army in the Netherlands mutinied not long after, seizing Antwerp and looting the southern Netherlands, prompting several cities in the previously peaceful southern provinces to join the rebellion. The Spanish chose the route of negotiation, and pacified most of the southern provinces again with the Union of Arras in 1579. Portugal required an extensive occupation force to keep it under control, and Spain was still reeling from the 1576 bankruptcy. In 1584, William the Silent was assassinated by a half-deranged Catholic, and the death of the popular Dutch resistance leader was hoped to bring an end to the war. It did not. In 1586, Queen Elizabeth I of England, sent support to the Protestant causes in the Netherlands and France, and Sir Francis Drake launched attacks against Spanish merchants in the Caribbean and the Pacific, along with a particularly aggressive attack on the port of Cadiz. In 1588, hoping to put a stop to Elizabeth's meddling, Philip sent the Spanish Armada to attack England. Even with the disastrous result, few can doubt that the Spanish fleet was among the strongest in Europe until the 1660s, when it suffered real humiliation. Spain had invested itself in the religious warfare in France after Henry II's death. In 1589, Henry III, the last of the Valois lineage, died at the walls of Paris. His successor, Henry IV of Navarre, the first Bourbon king of France, was a man of great ability, winning key victories against the Catholic League at Arques (1589) and Ivry (1590). Committed to stopping Henry of Navarre from becoming King of France, the Spanish divided their army in the Netherlands and invaded France in 1590. Faced with wars against England, France, and the Netherlands, each led by extraordinarily capable leaders, already-bankrupted Spain was outmatched. Faced with continuing piracy against its shipping in the Atlantic and the disruption of its vital gold shipments from the New World, Spain was forced to admit bankruptcy again in 1596. The Spanish attempted to extricate themselves from the several conflicts they were involved in, first signing the Treaty of Vervins with France in 1598, recognizing Henry IV (since 1593 a Catholic) as king of France, and restoring many of the stipulations of the previous Peace of Chateau-Cambrésis. A treaty with England was agreed upon in 1604, following the accession of the more tractable Stuart King James I. Peace with England and France implied that Spain could focus her energies on restoring her rule to the Dutch provinces. The Dutch, led by Maurice of Nassau, the son of William the Silent and perhaps the greatest strategist of his time, had succeeded in taking a number of border cities since 1590, including the fortress of Breda. Following the peace with England, the new Spanish commander Ambrosio Spinola pressed hard against the Dutch. Spinola, a general of abilities to match Maurice, was prevented from conquering the Netherlands only by Spain's renewed bankruptcy in 1607. Faced with ruined finances, in 1609, the Twelve Years' Truce was signed between Spain and the United Provinces. Spain was at peace. Spain made a fair recovery during the truce, ordering her finances and doing much to restore her prestige and stability in the run-up to the last truly great war in which she would play as a leading power. Philip II's successor, Philip III, was a man of limited ability uninterested in politics, preferring to allow others to take care of the details. His chief minister was the capable Duke of Lerma. The Duke of Lerma (and to a large extent Philip II) had been uninterested in the affairs of their ally, Austria. In 1618, the king replaced him with Don Balthasar de Zúñiga, a veteran ambassador to Vienna. He believed that the key to restraining the resurgent French and eliminating the Dutch was a closer alliance with Habsburg Austria. In 1618, beginning with the Defenestration of Prague, Austria and the Holy Roman Emperor, Ferdinand II, embarked on a campaign against the Protestant Union and Bohemia. Zúñiga encouraged Philip to join the Austrian Habsburgs in the war, and Ambrogio Spinola, the rising star of the Spanish army, was sent at the head of the Army of Flanders to intervene. Thus, Spain entered into the Thirty Years' War. In 1621, the inoffensive and ineffective Philip III was replaced by the considerably more religious Philip IV. The following year, Zúñiga was replaced by Gaspar de Guzman, Count-Duke of Olivares, a reasonably honest and able man who believed that the center of all Spain's woes rest in Holland. After certain initial setbacks, the Bohemians were defeated at White Mountain in 1621, and again at Stadtlohn in 1623. The war with the Netherlands was renewed in 1621 with Spinola taking the fortress of Breda in 1625. The intervention of Christian IV of Denmark in the war worried some (Christian was one of Europe's few monarchs who had no worries over his finances) but the victory of the Imperial general Albert of Wallenstein over the Danes at Dessau Bridge and again at Lutter, both in 1626, eliminated that threat. There was hope in Madrid that the Netherlands might finally be reincorporated into the Empire, and after the defeat of Denmark the Protestants in Germany seemed crushed. Perfidious France was once again involved in her own instabilities (the famous Siege of La Rochelle began in 1627), and Spain's eminence seemed irrefutable. The Count-Duke Olivares stridently affirmed "God is Spanish and fights for our nation these days," (Brown and Elliott, 1980, p. 190) and many of Spain's opponents may have grudgingly agreed. Olivares was a man sadly out of time; he realized that Spain needed to reform, and to reform it needed peace. The destruction of the United Provinces of the Netherlands was added to his list of necessities because behind every anti-Habsburg coalition there was Dutch money: Dutch bankers stood behind the East India merchants of Seville, and everywhere in the world Dutch entrepreneurship and colonists undermined Spanish and Portuguese hegemony. Spinola and the Spanish army were focused on the Netherlands, and the war seemed to be going in Spain's favor. 1627 saw the collapse of the Castilian economy. The Spanish had been debasing their currency to pay for the war and prices exploded in Spain just as they had in previous years in Austria. Until 1631, parts of Castile operated on a barter economy as a result of the currency crisis, and the government was unable to collect any meaningful taxes from the peasantry, depending on its colonies. The Spanish armies in Germany resorted to "paying themselves" on the land. Olivares, who had backed certain tax measures in Spain pending the completion of the war, was further blamed for an embarrassing and fruitless war in Italy (see War of the Mantuan Succession) The Dutch, who during the Twelve Years' Truce had made their navy a priority, had devastated Spanish maritime trade, on which Spain was wholly dependent after the economic collapse. The Spanish, after the destruction of the Armada, were simply unable to cope with naval threats. In 1630, Gustavus Adolphus of Sweden, one of history's most noted commanders, landed in Germany and relieved the port of Stralsund that was the last stronghold on the continent held by German forces belligerent to the Emperor. Gustavus then marched south winning notable victories at Breitenfeld and Lutzen, attracting greater support for the Protestant cause the further he went. The situation for the Catholics improved with Gustavus's death at Lutzen in 1632 and a key victory at Nordlingen in 1634. From a position of strength, the Emperor approached the war-weary German states with a peace in 1635; many accepted, including the two most powerful, Brandenburg and Saxony. Then France entered. Cardinal Richelieu had been a strong supporter of the Dutch and Protestants since the beginning of the war, sending funds and equipment in an attempt to stem Habsburg strength in Europe. Richelieu decided that the recently-signed Peace of Prague was contrary to French designs and declared war on the Holy Roman Emperor and Spain within months of the peace being signed. The more experienced Spanish forces scored initial successes; Olivares ordered a lightning campaign into northern France from the Spanish Netherlands, hoping to shatter the resolve of King Louis XIII's ministers and topple Richelieu. In the "année de Corbie", 1636, Spanish forces advanced as far south as Corbie, threatening Paris and quite nearly ending the war on their terms. After 1636, however, Olivares was fearful of provoking another bankruptcy, and the Spanish army never again penetrated so far. At the Battle of the Downs in 1639 a Spanish fleet was decimated by the Dutch navy, and the Spanish found themselves unable to supply their forces in the Netherlands. The Spanish Army of Flanders, which represented the finest of Spanish soldiery and leadership, faced a French invasion led by Louis II de Bourbon, Prince de Condé in the Spanish Netherlands at Rocroi in 1643. The Spanish, led by Francisco de Melo, were devastated, with most of the Spanish infantry slaughtered or captured by French cavalry. The high reputation of the Army of Flanders was broken at Rocroi, and with it, the grandeur of Spain. Traditionally, historians mark the Battle of Rocroi (1643) as the end of Spanish dominance in Europe. Supported by the French, the Catalonians, Neapolitans, and Portuguese rose up in revolt against the Spanish in the 1640s. With the Spanish Netherlands effectively lost after the Battle of Lens in 1648, the Spanish made peace with the Dutch and recognized the independent United Provinces in the Peace of Westphalia that ended both the Eighty Years' War and the Thirty Years' War. War with France continued for eleven more years. Although France suffered from a civil war from 1648-1652 the Spanish economy was so exhausted that they were unable to effectively cope. Naples was retaken in 1648 and Catalonia in 1652, but the war came effectively to an end at the Battle of the Dunes (1658) where the French army under Vicomte de Turenne defeated the remnants of the Spanish army of the Netherlands. Spain agreed to the Peace of the Pyrenees in 1659 that ceded to France Roussillon, Foix, Artois, and much of Lorraine. Portugal had rebelled in 1640 under the leadership of John IV of Portugal, a Braganza pretender to the throne. He had received widespread support from the Portuguese people, and the Spanishwho had to deal with rebellions elsewhere, along with the war against Francewere unable to respond, and the Spanish and Portuguese had existed in a de facto state of peace from 1644 to 1657. When John IV died in 1657, the Spanish attempted to wrest Portugal from his son Alfonso VI of Portugal, but were defeated at Ameixial (1663) and Monte Claros (1665), leading to Spain's recognition of Portugal's independence in 1668. Charles II and his regency were incompetent in dealing with the War of Devolution that Louis XIV of France prosecuted against the Spanish Netherlands in 1667-1668, losing considerable prestige and territory, including the cities of Lille and Charleroi. In the Nine Years' War Louis once again invaded the Spanish Netherlands. French forces led by the Duke of Luxembourg defeated the Spanish at Fleurus (1690), and subsequently defeated Dutch forces under William III, who fought on Spain's side. The war ended with most of the Spanish Netherlands under French occupation, including the important cities of Ghent and Luxembourg. The war revealed to the world how vulnerable and backward the Spanish defenses and bureaucracy were, though the ineffective Spanish government took no action to improve them. The final decades of the seventeenth century saw utter decay and stagnation in Spain; while the rest of Europe went through exciting changes in government and societythe Glorious Revolution in England and the reign of the "Sun-King" in FranceSpain remained adrift. The Spanish bureaucracy that had built up around the charismatic, industrious, and intelligent Charles I and Philip II demanded a strong monarch; the weakness of Philip III and IV led to Spain's decay. Charles II was retarded and impotent, dying without a heir and leading to the war of succession. As his final wishes, the childless king of Spain desired that the throne pass to the Bourbon prince Philip of Anjou, rather than to a member of the family that had tormented him throughout his life. Under the Treaties of Utrecht (April 11, 1713), the European powers decided what the fate of Spain would be, in terms of the continental balance of power. the new Bourbon king Philip V retained the Spanish overseas empire, but ceded the Spanish Netherlands, Naples, Milan, and Sardinia to Austria; Sicily and parts of the Milanese to Savoy; and Gibraltar and Minorca to Great Britain. Thus the Emire decisively turned its back on European territories. Moreover, he granted the British the exclusive right to slave trading in Spanish America for thirty years, the so-called asiento, as well as licensed voyages to ports in Spanish colonial dominions, openings, as Fernand Braudel, remarked for both licit and illicit smuggling (Brudel 1984 p 418). With a Bourbon monmarch came a repertory of Bourbon mercantilist ideas based on a centralized monarchy, put into effect in America slowly at first but with increasing momentum during the century. The Spanish Bourbons broadest intentions were to break the power of the entrenched creole aristocracies, and, eventually, loosen the territorial control of the Society of Jesus too: the Jesuits were expelled from Spanish America in 1767. In addition to the established consulados of Mexico City and Lima, firmly in the control of local landowners, a new rival consulado was set up at Vera Cruz. Immediately Philip's government set up a ministry of the Navy and the Indies (1714) and created first a Honduras Company (1714), a Caracas Company (1728),the only one destined to thrivea Havana Company (1740). In 1717�1718 the structures for governing the Indies, the Consejo de Indias and the Casa dela contrataci�n that governed investments in the cumbersome escorted fleets were transferred from Seville to Cadiz, which became the one port for all Indies trading. Individual sailings at regular intervals were slow to displace the old habit of armed convoys, but by the 1760s there were regular packet ships plying the Atlantic between Cadiz Havana and Puerto Rico, and at longer intervals to the Rio de la Plata, where an additional viceroyalty was creqated in 1776. The contraband trade that was the lifeblood of the Habsburg empire declined in proportion to registered shipping (a shipping registry having been ewstablished in 1735). Two upheavals registered unease within Spanish America and at the same time demonstrated the renewed resiliency of a reformed system: the Tupac Amaru uprising in Peru in 1780 and the rebellion of the communidades of Venezuela, both in part reactions to tighter, more efficient control. As a result, in the 18th century Spain was basically a client state of France, and hardly a superpower. Their sizable empire in America made them relevant, but it is difficulteven in light of Floridablanca's reformsto say that they were anywhere near the ranks of Austria or Russia, let alone France or England. Spain never would recover Gibraltar. However, the 18th century was a century of prosperity for the overseas Spanish Empire and Spain would recover of fast and effective form. The California mission planning was begun in 1769. The Nootka Convention (1791) resolved the dispute between Spain and Great Britain about the British settlement in Oregon to British Columbia. In 1791 the king of Spain gave Alessandro Malaspina an order to search for Northwest Passage. The intrusion of Napoleonic forces into Spain in 1808 (see Peninsular War cut off effective connection with the empire. Spain lost her possessions on the mainland of America with the independence movements of the early 19th century, during the power vacuum of the Peninsula War. In the 19th century, Spain was taken over by Napoleon without firing a shot, the Peninsula war ensued, followed by a power vacuum lasting up to a decade and turmoil for several decades, civil wars on succession disputes, a republic, and finally a corrupt liberal democracy. Spain lost all the colonial possessions in the first 3rd of the century, except for the swaths of desert given to it by the European powers when they partitioned Africa, and Cuba, Puerto Rico and the Philippines, isolated on the far side of the globe. It is indefensible to say that the Spanish were a world power at any point in the nineteenth century, save for a brief spit in the 1870s when the capable Alfonso XII of Spain and his thoughtful ministers succeeded in restoring some vigour to Spanish politics and prestige. In the 19th Century, the Romantic travellers, converted Spain into an exotic country. Now Spain was a colony of France and England. Nevertheless, Spain held onto significant fragments of its empire until the Spanish-American War of 1898, and its coastal toeholds in Africa lasted even longer. In the late 19th century, Spain colonized the islands of Palau. The Marshall Islands were claimed by Spain in 1874. At the end of the century most of the remaining Spanish Empire ( Cuba, Philippines, Puerto Rico and Guam ) was lost in the Spanish American War in 1898. In 1481 the papal Bull Aeterni regis had granted all land south of the Canary Islands to Portugal. Only these archipelago and the cities of Sidi Ifni (1476-1524), known then as "Santa Cruz de Mar Pequeña", Melilla (conquered by Pedro de Estopiñán in 1497), Villa Cisneros (founded in 1502 in actual Western Sahara), Mazalquivir (1505), Velez (1508), Oran (1509-1790), Argel (1510-1529), Bugia (1510-1554), Tripoli (1511-1551), Tunez (1535-1569) and Ceuta (ceded by Portugal in 1668) remained as Spanish territory in Africa. In 1778, the Bioko Island, adjacent islets, and commercial rights to the mainland between the Niger and Ogoue Rivers were ceded to Spain by the Portuguese in exchange for territory in South America (Treaty of El Pardo). In the XIX century, some Spanish explorers and missionaries would crossed this zone, as Manuel de Iradier. In 1860, after the Tetuan War, Morocco ceded Sidi Ifni to Spain as a part of the Treaty of Tangiers. The following decades of Franco-Spanish collaboration resulted in the establishment and extension of Spanish protectorates south of the city, and Spanish influence obtained international recognition in the Berlin Conference of 1884: Spain administered Sidi Ifni and Western Sahara jointly. Spain claimed a protectorate over the coast of Guinea from Cape Bojador to Cap Blanc, too. Río Muni became a protectorate in 1885 and a colony in 1900. Conflicting claims to the Guinea mainland were settled in 1900 by the Treaty of Paris. In 1911, Morocco was divided between the French and Spanish. The Disaster of Annual (1921) was a grave military defeat suffered by the Spanish army. Between 1926 and 1959, Bioko and Rio Muni were united as the colony of Spanish Guinea. Spain lacked the wealth and the interest to develop an extensive economic infrastructure in his african colonies during the first half of the twentieth century. However, through a paternalistic system, particularly on Bioko Island, Spain developed large cacao plantations for which thousands of Nigerian workers were imported as laborers. The Spanish also helped Equatorial Guinea achieve one of the continent's highest literacy rates and developed a good network of health care facilities. In 1956, when French Morocco became independent, Spain surrendered his Spanish Morocco to the newly independent Morocco, but retained control of Sidi Ifni, Tarfaya region and Western Sahara. Moroccan Sultan (then King) Mohammed V was interesting in these Northern African Spanish territories and there was a Invasion of Spanish Sahara by Moroccan army, also known as the Ifni War and, in Spain, the Forgotten War (la Guerra Ignorada). In 1958, Spain ceded Tarfaya to Mohammed V and joined the previously separate districts of Saguia el-Hamra (in the north) and Río de Oro (in the south) to form the province of Spanish Sahara. In 1959, the Spanish territory of the Gulf of Guinea was established with status similar to the provinces of metropolitan Spain. As the Spanish Equatorial Region, it was ruled by a governor general exercising military and civilian powers. The first local elections were held in 1959, and the first Equatoguinean representatives were seated in the Spanish parliament. Under the Basic Law of December 1963, limited autonomy was authorized under a joint legislative body for the territory's two provinces. The name of the country was changed to Equatorial Guinea. In March 1968, under pressure from Equatoguinean nationalists and the United Nations, Spain announced that it would grant independence to Equatorial Guinea. At independence in 1968, Equatorial Guinea had one of the highest per capita incomes in Africa. In 1969, under international pressure, Spain returned Sidi Ifni to Morocco. Spanish control of Western Sahara endured until the 1975 Green March prompted a withdrawal. The future of this former Spanish colony remains uncertain.